“Organic moonshine roots music” is how she describes it. With Memphis Blues laced through the rural Tennessee mountain twang, this record has a bucketful of roots to draw from. Her distinctive voice is what grabs me. Plaintive but soulful. 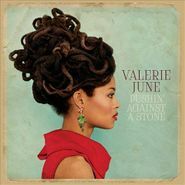 Valerie June is a well-kept secret no more with the release of her latest album, Pushin' Against a Stone. Co-produced by The Black Keys' Dan Auerbach, who also lends some songwriting help, Pushin' Against a Stone sees June spinning tales of a life of struggling to be heard — "I ain't fit to be no mother ... I've been workin' all my life" she sings at the outset of the album over a syncopated beat on "Workin' Woman Blues." Her voice, a froggish thing somewhere between BIllie Holiday and Joanna Newsom, takes some getting used to, but it suits the variety of styles June tries on, from Appalachian folk ("Somebody to Love") to swaying, gospel-tinged pop ("The Hour"). Auerbach, for the most part, doesn't flood June with oversaturated or overly rocky production, instead letting June's voice carry through brittle, beautiful folk songs, but his touch helps give songs like the title track some added oomph, with a fuzzed out guitar offering counterbalance to the song's organ-laden blues, while June makes for a convincing blues-rock frontwoman on "You Can't Be Told," sounding like a successor to Wanda Jackson. While Pushin' Against a Stone is a highly accessible record, June is still definitely an odd bird. But it's her unclassifiable nature and unique voice that give the album flight.